In making their competing Fyre Festival documentaries, the producers of both Hulu’s Fyre Fraud and Netflix’s Fyre: The Greatest Party That Never Happened wade into some murky (occasionally pig-filled) ethical waters. The documentaries are rich in outrageous details about the infamous 2017 tropical destination music festival-turned-millennial Lord of the Flies disaster–and don’t get us wrong, we absolutely watched both. But before you buy into either film’s narrative, let’s consider how they were made. Perhaps the most visible difference between the films is the screen time dedicated to Fyre founder Billy McFarland, who was only directly interviewed for the Hulu doc. Jenner Furst and Julia Willoughby Nason, the directors of Fyre Fraud, paid for McFarland’s participation in their production, which is unorthodox but not necessarily uncommon. What they got for their money was eight hours of on-camera interview time with McFarland and the license to use a cache of footage he controlled. McFarland is very much the central character of Hulu’s doc, which takes viewers back to his first entrepreneurial efforts as a college kid who couldn’t even pull off a school demo day for his app, but wasn’t about to let that stop him from moving to New York City and plowing full steam ahead. It’s clear he wants to be seen as a sort of scrappy hustler rather than the slimy, lying grifter that some of the public has perceived him to be. Russian model Anastasia Eremenko, McFarland’s girlfriend, appears as well, speaking to his charisma and intelligence. Furst and Willoughby don’t let McFarland off the hook with softball questions, and he certainly doesn’t look good at the end of the film, but it still makes one wonder if closeness to the subject–and maybe a desire to get their money’s worth out of the interview they paid for–influenced the final cut. According to a version of events that Chris Smith, director of Netflix’s Fyre, shared with the Ringer, this exchange was how his production found out that Hulu was working on a competing doc. Smith recalls that McFarland approached his team saying that Hulu had offered the disgraced event producer $250,000 for his story, and McFarland would give an account to Netflix’s film for $125,000. Smith declined. What Fyre lacks in access to McFarland’s archive of footage, it makes up for with access to social media and behind-the-scenes video from Jerry Media. The portrayal of Jerry Media’s involvement with the festival’s crew is another point of pretty significant deviation between the two docs. The agency was brought in early and tasked with cultivating the models-and-Jet-Skis image that lured influencers and encouraged regular rich kids to part with their money. Jerry’s project included coordinating the infamous “orange tile” social media stunt, paying Kendall Jenner to hype the lineup, and organizing a video shoot on the island that supplied an Instagram feed’s worth of content. As things began to spiral out of control, the job also included deleting any questions or comments on social media that could undermine the operation’s elaborately constructed facade. 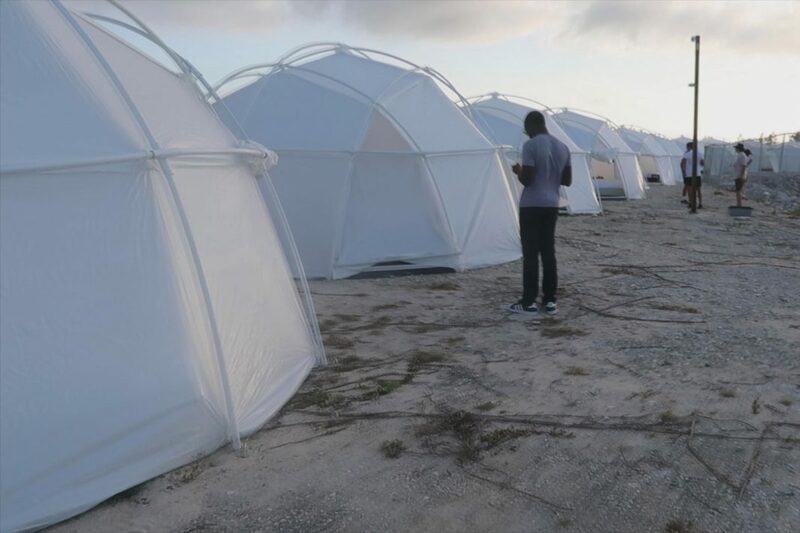 Fyre Fraud, which relies heavily on interviews with one former Jerry employee, Oren Aks, gives the impression that the marketing agency had serious doubts from the very beginning about the legitimacy of what it was selling, but kept hawking anyway. In contrast, the Netflix movie, which Jerry helped produce, makes the agency seem more like well-meaning professionals trying their best with a difficult client, reporting customer complaints to the Fyre team before deleting them, and ultimately cutting ties with the festival once things broke bad on the ground. In the Hulu version, the staff starts marking ticket categories as “sold out” because they realized there was no way the infrastructure would be sufficient; in the Netflix version, tickets actually sell out, possibly due to the excellent online marketing provided by Jerry. An official statement from Netflix about Jerry’s relationship to the film states that, “at no time did they, or any others we worked with, request favorable coverage in our film, which would be against our ethics.” Jerry isn’t just a producer of and participant in the film–it was the agency’s staff who approached Vice with the idea of a Fyre Fest documentary, less than three months after the disaster took place. Regardless of questionable details, one thing is at the core of both films: McFarland is a fraudster and criminal, and despite how you feel about bilking affluent young concertgoers, the real victims of the festival debacle were the workers, including dozens of Bahamian locals, who were ripped off for huge sums of money. It’s worth watching both to see the different approaches, and to soak up maximum dirt on the whole crazy scheme. And, of course, if Ja Rule wants to make a third documentary with his version of the story, we will 100 percent watch that, too.